Here it is again and this time it’s even better. We are talking about the new game – Ben 10 Escape Route. This game takes the adventures of Ben 10 Cavern Run to a whole new level. The sole mission is to make the route for Ben 10 to escape the deadly levels. Make laser bridges and guide Ben 10 from the entry gate to the exit gate. 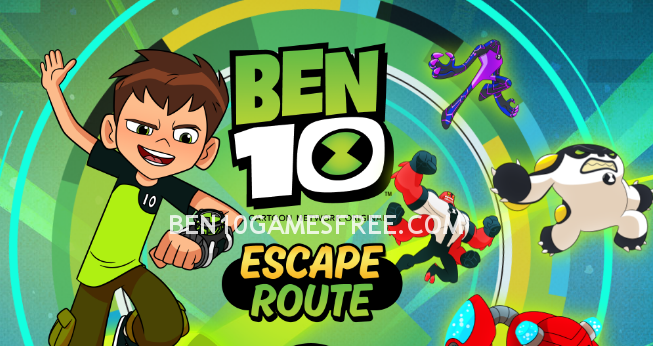 Ben 10 Escape Route Game is a superb running game. You have to help Ben 10 escape the underground alien city. Just like the previous version, in this game too you can use the powers of Omnitrix to transform into powerful aliens and complete the missions. Wait, don’t be in such a hurry. Read the important techniques below that will help you win Ben 10 Escape Route game. Recommended: Play Ben 10 Alien Swarm game online for Free now! This ben 10 running game has three chapters and each chapter has multiple levels. Each level has different obstacles to clear. At the beginning of every level, Ben 10 appears at the entry gate and starts running towards the exit gate. But the way to the exit gate is not that easy and that’s where your work begins. You have to make laser bridges and walls to direct Ben in the correct direction. To complete a level, you have to collect the maximum number of green orbs and reach the exit gate without falling or getting hit. Also, there are different obstacles in each level such as waterfalls, rock walls and aliens. To tackle these obstructions, you have to collect the Omnitrix orbs and you will automatically transform into one of the four aliens i.e. Cannonbolt, Water Hazard, Four Arms or Purple Upgrade. Pro Tip: Always transform into one of the aliens according to the obstacle ahead. Well, that’s all the training you needed. Now, its time to begin the show and win! With the powers of Omnitrix, make a route for Ben 10 escape the underground city and Win! Good Luck!! Don’t Forget to give your rating for Ben 10 Escape Route game and share your tips and tricks to win this game in the comments section below.